Editor’s note: There’s a knock on the Time+Tide HQ front door. It pushes open and a face pokes around. Is this Time and Tide, the watch website? (There’s no signage, so it takes logo recognition to find us.) Felix, Emma, Sarah or I jump up, walk over and say, yes it is, how are you, etc. Conversation turns quickly to watches — when they discovered us, what’s next for their wrist. And then, in all seriousness, seven times out of 10, it lands on the fact that you can’t buy a recent Rolex. Why? We usually steer the conversation in a positive direction. You CAN buy a recent Rolex and we show them pics of the DJ41, which is among our favourites of the last few years — along with the stunning grey-dialled OP39 (also widely available), a watch that one day will be mine, oh yes, it will be mine. Sure, it’s not as racy as a GMT Master-II, or as shiny as a ceramic bezelled Sub. It’s not as stealthy as a 2017 Sea-Dweller, but it has all the Rolex hallmarks in spades — to the extent that when it was released in 2017, Felix actually named it as his best Rolex in show. Let’s revisit the DJ41. Forget the fuss about the Sea-Dweller and the palaver over the Sky-Dweller, the real Rolex of 2017 is the Datejust 41 in steel. On the surface, the reasons might not be immediately obvious. 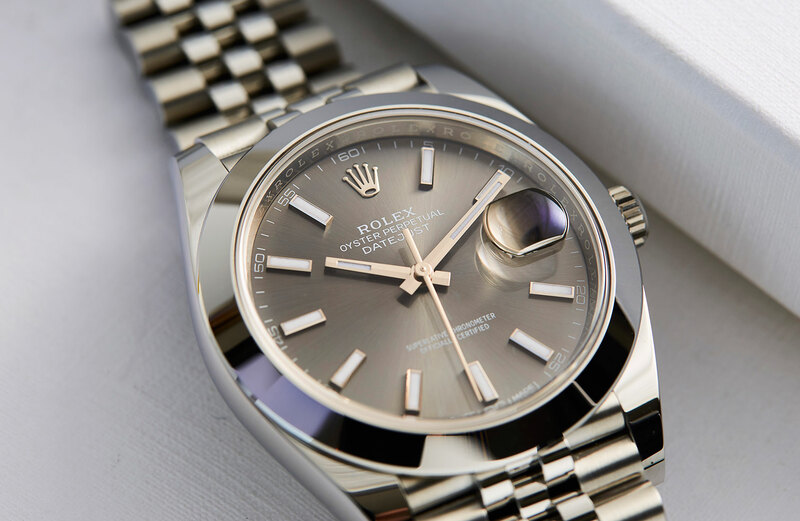 After all, the Datejust 41 isn’t new (it was released last year in yellow and Everose Rolesor versions), and its looks are almost the very definition of classic. But despite this — or because of it — we’re confident in predicting that the steel Datejust 41 will be one of their most popular models this year. Let’s step back for just a second. What is a Datejust 41, and where does it fit in the Rolex ecosystem? Well, the second part of the equation, the 41, is simple enough — it refers to the 41mm case size. But the Datejust itself requires a jot more explanation. 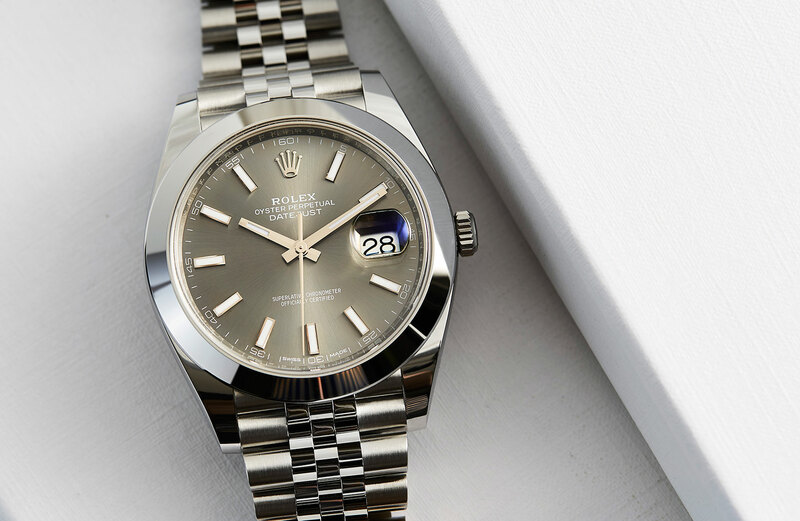 Originally introduced way back in 1945, the Datejust is a prime example of one of the quiet revolutions that make Rolex the powerhouse it is today. The innovation of the Datejust was that the date ‘jumped’ at midnight, rather than slowly dragging across over a few hours. Simple, but significant. Add to this the iconic elements of the Oyster Case, Cyclops and Jubilee/Oyster bracelet and you’ve got a watch worn the world over and is often imitated, but rarely bettered. History lesson over, let’s get back to this 2017 release. What’s new? In a word, steel. 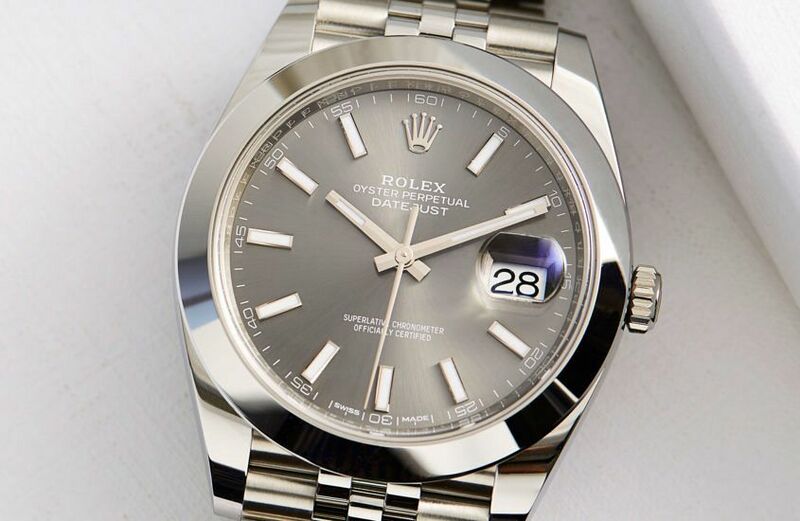 When the Datejust 41 was shown in Rolesor, people were excited — Rolex had finally brought the proportions and elegance of the timeless DJ into a more modern case size (side note: 2009’s Datejust II had a 41mm case size, but the bulkier proportions didn’t win everyone over), but even on day one of release, people were speculating about steel versions. Why? Well, steel is stylistically versatile and has less of a price tag premium than precious metals. The other major selling point in the DJ 41’s favour is the movement. The calibre 3235 is one of Rolex’s next-generation movements, with the new Chronergy escapement, which aids precision and magnetic resistance. It’s rated to within +2/-2 seconds a day and has three days of power reserve. 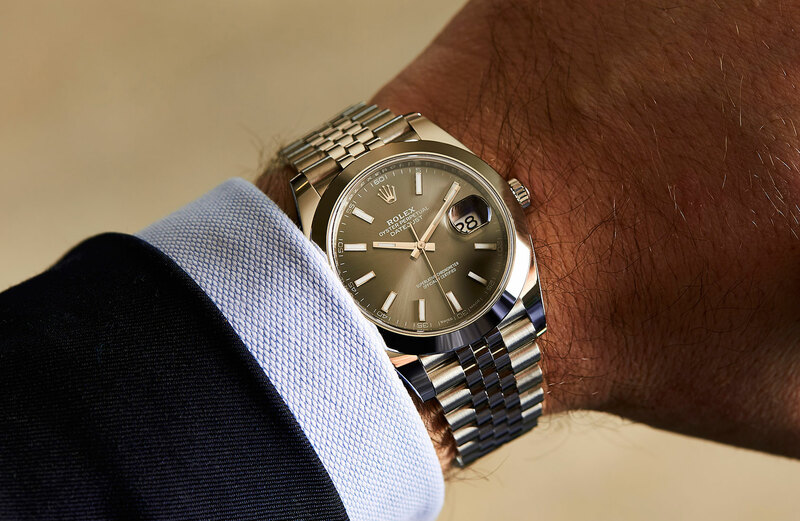 These factors combined ensure that the steel Datejust 41 is set to be hot property, ticking the boxes for the ‘one good watch’ brigade and die-hard collectors alike. 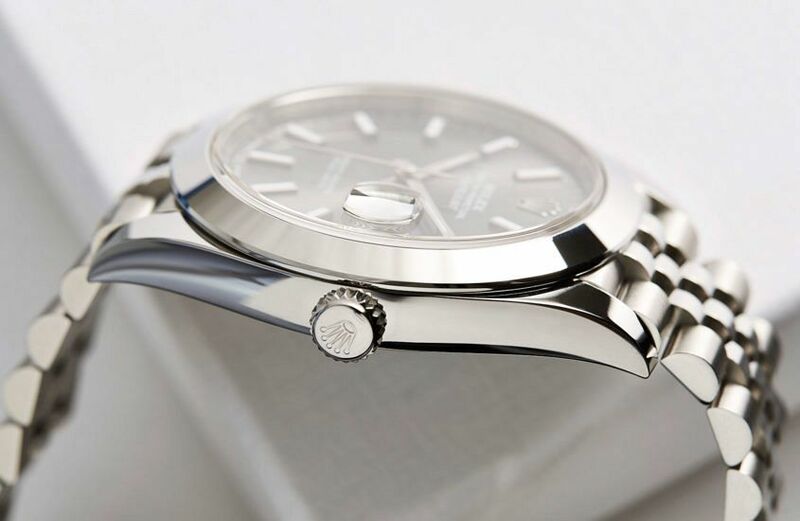 Add to this that it’s offered in a range of options — white or black dial on Oyster, this dark rhodium version on Jubilee, as well as numerous other versions with white gold fluted bezels (technically bumping it into the ‘Rolesor’ category) — and there’s something for everyone. Finally, what’s it like on the wrist? Well, I’ve always found Rolex watches some of the most satisfying to wear. There’s something about the comfort, weight, and on-the-wrist ergonomics that is unique to the brand. Though to be fair, a significant amount of this is likely down to just how far the brand values and identity have seeped into my subconscious. It’s supremely comfortable and it hit the right balance between dressy and casual. I didn’t want to take it off.